A quality drawing tablet can last for years so it’s a big investment. This is certainly true for display-style tablets that come with screens for drawing. They’re often pricier but tend to be easier for artists who do a lot of digital work. But finding a tablet you like is crucial. In my opinion the absolute best display drawing tablet is the Wacom Cintiq. 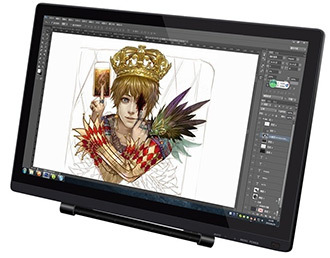 It’s a premium tablet for serious artists and you definitely get what you pay for. With a brilliant display, excellent pressure sensitivity, and impeccable hardware, nothing comes close to beating the Wacom Cintiq. There’s a reason professional artists & animators all use Wacom tablets and this is the best of the best. If you can’t fit a 22HD model on your desk I’d still recommend the 13HD since the hardware and drawing surface feels very similar. But I know that not everyone can afford the Wacom brand so it’s not gonna always work. That’s why I put together this guide organizing the absolute best display tablets on the market. If you’re looking for a great tablet with a display screen then you’ll definitely find something you like in this post. We published a complete buyer’s guide to drawing tablets covering all the major features you should look for. That guide is an excellent place to start if you’ve never bought a tablet before, and/or if you’re looking to make a list of the most important features before you buy. With that said I’d argue display tablets have a bit more to consider. First of all you need to make sure you measure your desk for the appropriate space. The last thing you’d want is to buy a tablet that’s too big for your working area. Some models have a variety of sizes while others are just a single display with no alternatives. But tablet size should be the first thing you look at. From the list above I’d say cable management setup is much more important than people realize. If your power outlet is located to the right side of your desk then you’ll need cables running along that side. How many cables would come with your tablet and how long do they need to be? Can they reach your outlet? Would they get in the way of other things on your desk? Generally speaking the majority of tablets with displays come packed with accessories ready to go. These are high-end products so you aren’t getting some junky scratch pad thrown together at the last minute. This means the majority of them support at least Windows/Mac and many will run on Linux too. Before deciding on your final tablet just make sure you get some measurements of your desk space and feel comfortable with the setup. If you can fit a large 22″ tablet on your desk with no space problems then you know what range you’re working with. If you have the space and the budget I would highly recommend grabbing a Wacom Cintiq as your display tablet. This is seriously the highest top-of-the-line tablet you can get. It’s used by professionals in all areas of the entertainment industry from Disney to Blizzard. Wacom has been around for years so it’s a trusted brand with some quality hardware. Setup is really easy and by default this comes with a large widescreen interface. Perfect for those who are used to working on a widescreen monitor. The display is crisp with a fairly smooth surface to draw over. I noticed a bit of glossy-ness on the screen which was more of a mild annoyance than anything. If you adjust positioning to keep light directly off the screen it won’t make a huge difference(and it’s a slight sparkle at best). First thing you’ll notice: the build. It’s very sturdy. For something in this price range you’ll want a product that can last and that’s exactly what Wacom offers. Drawing on this should feel smooth and natural. Everything from stylus pressure to the tilt of your stylus and even working near the corners of the screen, all of it feels very natural. And you can adjust the angle of the tablet to bring it up or down. I didn’t measure degrees but I’d say the lowest is almost completely flat(maybe 15°?) and the highest would be around 75°. I like to work at a pretty steep slant to avoid arching my back. Could not say I had any problems working with a steep slant or with it closer to the surface. The cord that comes with this tablet is a 3-in-1 HDMI/USB/AC adapter. This is thick. It runs behind the tablet and would need to go around whatever else is on your desk. Plus the cord is not super easy to “bend” so it’ll take some time to setup. Really, I don’t see this as a huge deal but some artists might not like it. Especially since this tablet already measures about 2 feet in total. Now if that’s too big you could always get the smaller 13HD model which I’m quite partial to using on my lap or while traveling. But I’d argue both sizes are fantastic and you will love the professional feeling of a Wacom under your stylus. But this company has developed a great set of tablets that work incredibly well for all types artists from 3D modelers to digital painters. When it comes to a display tablet I tip my hat to the GAOMON PD1560. It’s a phenomenal mid-range tablet that really feels like a high-end computer with a much cushier price point. This comes with a 1080p resolution and a screen measuring 13.5″ W x 7.6″ H. That’s a very reasonable size for anyone’s desk. Total resolution measures 5080 LPI which is above the norm and it responds great to pressure. I’m not sure if it’s the stylus or the screen but this feels just as responsive as a typical Wacom display tablet. Over to the left you’ll find 10 express keys with 2 designed for increasing/decreasing brush size and the other 8 meant for tools. But you can program these hotkeys to do whatever you want. Then along the actual side of the unit you’ll find 5 menu keys. Efficient and easy to access, but I think they would feel better in the back. Still, they don’t get in the way so I can’t complain. Setup is mostly simple and the cable comes as one big pack. This means you’ll get the power, HDMI, and USB all together which feels nice. My gripe with the setup is the initial sensitivity and color calibration. This isn’t easy to deal with and may take you a while to get it just right. Especially if you’re on an older operating system. Once it’s setup you’re gravy but the process can feel a bit discouraging. The rechargeable pen feels great and holds power for quite a while. The tablet stand is also very sturdy so you’ll have no trouble adjusting the display. All-in-all this is one heck of a tablet from a newer brand. 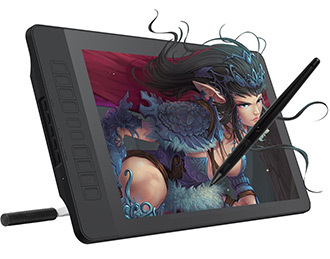 If you’re wary of straying from Wacom but you simply want to try something else then I’d suggest nabbing this GAOMON model. You may find yourself surprised at just how much this feels like a Wacom tablet. Another newer brand in the tablet space is Artisul. And they make some really nice tablets. Their Artisul D16 is the largest display tablet they make. It comes with a 15.6″ LCD screen and it has some of the most eye-popping colors I’ve seen in a tablet this size. Full 1080p resolution and a brilliant backlight makes this tablet super easy to draw on from anywhere. At your desk, on your lap, or while traveling. It’s all good. If you’re worried about glare on the screen this also comes with a matte screen protector totally free and pre-applied to the tablet. If you don’t want it just remove it. Along the side of the tablet you’ll find 7 express keys that do feel really easy to access. I was surprised at how small the keys were but you adjust to them over a short period. Setup works like a breeze and the Artisul calibration is superb. I do think the cable management on this one is a bit annoying though since they are all separate. And the HDMI + USB cable need to both plug into your computer to work properly. Not a huge deal if you can hide the wires behind your desk. But if you’ll take this on the go frequently it might be a pain to plug it back in many times over. Still, it’s nice to see a unit that works without an AC cable. It draws power 100% from the USB cord. And I can’t get enough of this drawing experience. It has to be one of the best for any display tablet of this size. Specifically the Artisul stylus pen just feels so nice. It’s thick and easy to grip but doesn’t get in your way. The quick buttons on the stylus are also easy to access without being so large that you accidentally push them. And it’s super light because the stylus has no battery. Hooray! On the whole I’d still slightly prefer a Wacom 13HD over the Artisul, but you simply cannot beat the price on this model. That’s what draws me in and really makes me think that Artisul could be a fierce competitor to the Wacom brand. A little while back we published a detailed review of the Parblo Coast22 tablet. It’s a fantastic model and it comes from a reputable manufacturer. They’ve also got a smaller version called the Coast10 which works better for artists on the go, and also for artists on a lower budget. However between the two of them I really prefer the Parblo Coast22 display. I wouldn’t say it’s better than the GAOMON when comparing them against a Wacom. But I do think the Coast22 feels better relative to its size. For a display tablet the Coast22 is fairly large measuring about 2 feet across. The screen itself measures at just under 2 feet and it comes with the same 1080p resolution you expect from a tablet this size. With the adjustable stand you can also get lots of flexibility here. I’d estimate the screen goes down to about 10° flat and raises up to almost 80° or so. I’ve noticed the pen also draws clearly whether you’re directly on the screen or working at an angle. Inside the package you get a ton of goodies. This comes with a battery-free stylus, 6 replacement nibs, a stylus holder, an artist glove, a cleaning cloth, and some other bonus things. Now on sensitivity: you can lay down lines pretty smoothly in most programs. But if you’re working fast you will likely see a delay. The tablet itself is pretty sensitive to the stylus and the battery-free pen feels awesome to work with. But the delay can be annoying and this likely works better with a very powerful computer. I would not say this delay is a nuisance. In fact, most of the time you won’t even bother to slow down because you’ll know how the pen marks will lay out. It’s just something I noticed that isn’t as common with Wacom tablets. Still, as an alternative to the Wacom brand Parblo will deliver. There’s a lot of mixed opinions on Huion tablets because they come with such a wide variety. The Huion GT-220 recently got a v2 upgrade and this new model is lightyears ahead of the older one. It does have many of the same “features” but it’s designed with a sleeker body and it just feels more responsive. Looking over the actual display it’s pretty nice. It measures 21.5” across and takes up the majority of the tablet space. This tablet has an IPS display which many artists prefer, although I’ve personally never noticed much of a difference. I did notice screen glare with a ceiling light directly overhead. But this was easily remedied by working with my desk lamp instead. Compared to Huion’s old stylus pens these are golden. They feel so much lighter and leave a stronger mark without a ton of pressure. Although this may be due to more pressure sensitivity, but the pens themselves are easier to hold for sure. And did I mention you get two pens with this tablet? Cause that’s pretty awesome. But let’s cover one of the biggest downsides of this tablet: no express keys. It seems crazy but it’s true. Huion still hasn’t put express keys into this model, which to me seems crazy. If you’re gonna buy a display tablet then wouldn’t you want at least a couple hotkeys for quick access? I think it’s because of the model’s design and the size of the screen that Huion left these out. If you’re accustomed to using hotkeys this model will feel weird. But it’s easy to adjust over time. If no hotkeys = deal-breaker then you’ll wanna look elsewhere. With the adjustable stand you can change the angle to almost flat and almost fully upright. This one’s very sturdy too so you can lean into it pretty hard. I mean, within reason. Setup is easy, working is easy, and pressure sensitivity is great. Overall it is a really nice tablet and surprisingly powerful if you can get past the lack of hotkeys. I hadn’t heard much about the XP-Pen Artist16 Pro until very recently. We actually published a fantastic review of this tablet covering all its features and a full unboxing. Suffice it to say XP-Pen got it right on this one. It actually reminds me of the Artisul tablet except it feels a little bigger and somewhat lighter to carry. It does use separate cables for HDMI & USB so it’s not too cluttered. But also not as simple as just one cord. These cables pop out the back and run any way you want so they’re pretty flexible. I do notice the cord plug area can get hot with hours of use but it never feels unsafe or dangerous. Just one of those tablets that exudes more heat than it absorbs. 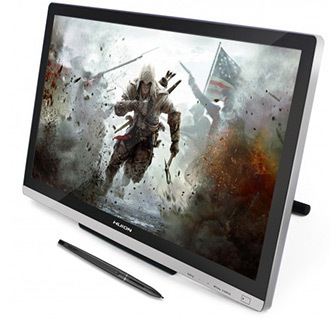 The resolution is perfect considering its size and you won’t feel any problems while drawing. In fact, this has to be one of the smoothest drawing surfaces going. I wouldn’t suggest using a screen protector here unless you really hate the smoothness. It handles pressure very well and it’s surprisingly sturdy. But when this is tilted at a strong angle(above 70°) it can feel more wobbly compared to when it’s around 45° or lower. I also noticed while drawing at a higher incline there is more parallax. It’s not a huge problem and truthfully not something I would complain about. However you’ll notice this more if you’re coming from a higher-end tablet like a Cintiq. That said, you’ll adjust fast. There’s no reason to dislike the Artist16 considering it feels incredibly cozy and calibrates fast. It’ll even run well on somewhat “slower” computers with older processors. This surprised me since I don’t even have a graphics card in my current setup and I’m using the onboard graphics. If you can work with the price and you like the size of this tablet I’d say give it a go. 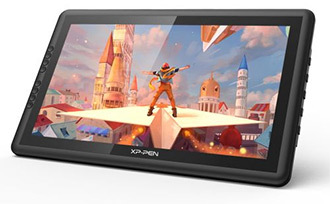 I’ve never had a bad experience with XP-Pen and I’m seeing many great tablets coming from their brand. Ugee falls somewhere between a budget tablet and a mid-range option with quite a few models to pick from. They actually have a small lineup of display tablets but their highest quality option is the Ugee UG-2150. It comes with an IPS screen and measures about 21.5″ across. Total dimensions are 20″ W x 12.5″ H so the screen takes up the majority of the space. It’s not a terrible screen but it’s not better than anything else here. Typical 1080p resolution, nice bright display, and strong color calibration with their drivers. What I do like is the easily adjustable stand which has a switch right in the back of the unit. 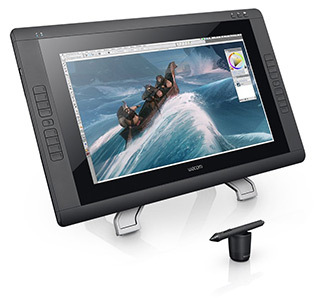 This lets you adjust the display angle with ease and change your drawing position fast. You’ll also find the backlight switch in this same area to adjust the lighting. Ugee is pretty great to their customers when it comes to extra goodies. Not only do you get an adjustable stand but you also get two rechargeable pens, 10 replacement nibs, a stylus holder, a drawing glove along with a screen protector and a cleaning cloth. It feels nice to open up your box and have all these goodies just waiting for you. Really nice touch. That said, I’m not a huge fan of the screen protector since I don’t think you need it for this model. The screen’s surface feels “rough” enough that it can mimic paper in a sense. I wouldn’t want to add anything on top of it, but to each their own. Cable management is a nuisance so ideally this would be a stay-at-home tablet that remains on your desk. It comes with an HDMI and VGA cable for the display, along with a USB cable and a power cord. If you’re okay with a small mess from your cables then Ugee’s model will fit in great on your desk. Or if you have cable ties to manage the mess, even better. The actual drawing experience is pretty darn good and I’d say the stylus pens can rank up there with Wacom’s. The pen feels light enough considering this model does have batteries, but this pen also gives you incredible control over the tilt and degree of pressure. Even if you’re drawing closer to the edges you should have no problem laying down marks. This can sometimes be a big issue with display tablets but I can say I had no issues with this model. Setup shouldn’t be tough but if you are on a newer OS I’d suggest going to Ugee’s website and downloading the drivers directly. They update semi-frequently, especially for newer operating systems, and it’s easier to get this installed when you start with the newest drivers first. That said you really don’t need to be a tech guru to get this working. It should be very much a plug & play operation once you’ve calibrated everything and gotten the drivers installed. As far as display tablets go, this is a bit on the heavier side and the cables aren’t the most fun to manage. 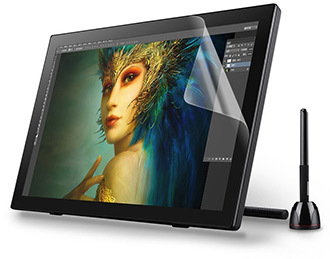 But considering all the bonus gifts you get, plus the incredible sensitivity from this display, it’s a great choice for any artist just nabbing their first larger display tablet. Especially if you plan to use this primarily on your desk in one location. Getting a display tablet is a big leap so you want to consider all your options. Especially because there is no single “best” product for everyone. But if you want a surefire trusted tablet that will last for years then I’d highly recommend a Wacom Cintiq 22HD. Or if you need a smaller model the Cintiq 13HD works just as well. 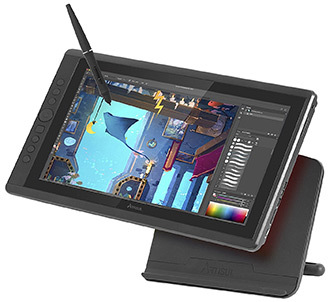 Both are incredibly powerful drawing tablets with brilliant displays, top-tier technology, and a warranty backed by a trusted brand used by professional animators & artists across the world. If Wacom doesn’t suit your needs or can’t fit within your budget then any of the other models listed here should work just fine. For alternatives I’m really fond of Artisul and GAOMON since they both deliver a similar quality that falls within the same ballpark as Wacom. But have another look over this list and see what you think. Buying a display tablet is a big decision so you need to know what you’re looking for. That said, once you find what you want just grab it and start drawing!